The oldest and the easiest way to care for the skin is to use various oils. However, first and foremost we need to learn the difference between all kinds of oils that exist in order to find an adequate application. Two basic types of oils are: herbal oils and mineral oils. Herbal oils, as their name implies, originate from plants and they get, most often, the name of the plant from which they originate. Herbal oils contain fine molecules that easily penetrate into the skin, and because of this, they are more suitable for skin care. Mineral oils (petroleum jelly, paraffin) are synthetic oils obtained by chemically treating oils. They are famous because they consist of large molecules that that clog the pores and poorly transmit the active ingredients that are necessary for the skin. Therefore, we should be careful when choosing oil and for what purpose we want to use it for. As the name itself says, it is intended for babies. We can now wonder how a synthetic oil can be good especially for babies, but the answer exists. Since skin has a difficult time to absorb it, it is almost as if it was created just for small children wearing nappies. You have certainly heard about a baby's nappy rash, which is why a baby's oil is placed in order to create a protective layer between children's skin and diaper. In the same way we can alleviate the pain in older people who are forced to wear adult diaper for health reasons. If you have any other baby oil at home you did not use, there is no reason to throw it away since it can be useful to you in many ways you probably have not heard before. If you have stubborn soap stains in your bathroom, you can simply remove them with the help of a small amount of baby oil. Put a little oil on the stain and let it work for a few seconds, and then just wipe it. Do you have problems with zipper slider? It must have happened sometimes that your zipper slider is stuck. To fix this, lubricate it with baby oil. Wait a few minutes, then drag it up and down. You will see that it will work like a new one. Baby’s oil is suitable for cleaning wooden and chrome surfaces. Apply oil on cloth and rub the furniture or tables with circular movements, which will make them shine. If you run out of wet wipes, you can make them using kitchen cloths and baby oil. Cut a few pieces of kitchen cloths, fold them in half and put in a plastic box in which you have half a cup of water, one teaspoon of baby shampoo and one teaspoon of baby oil. Let the cloths get soaked. When you find glued bubble gum bellow table, on the floor or even in the hair, do not despair. Beat it with baby-oil, apply it and wait a few minutes, then lightly remove it. 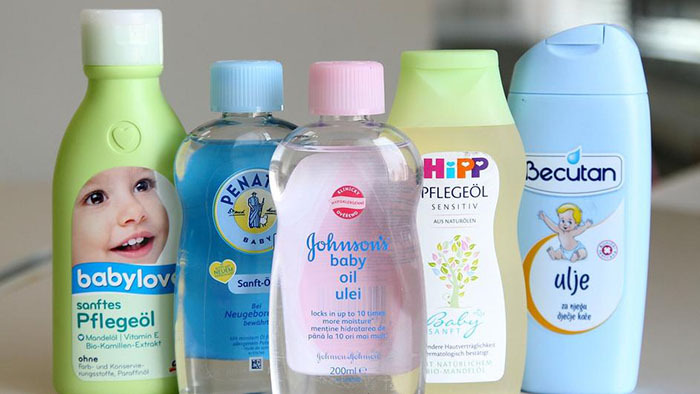 Baby oil for shaving legs is a much better choice than shaving foam. It nourishes the skin, makes it smooth, and the greasy layer allows the razor to slip over the skin and better remove unwanted hair. You will not irritate the skin and it will improve the removal of hair from any part of the body. It often happens that more wax is accumulated in the ear canal than is needed to protect our ear. We most often use cotton swabs to clean our ears. However using a dry cotton swab we can make our problem even worse since instead of cleaning it we compact it further down the ear canal and then doctor’s help is needed. To prevent this, it is enough for you to put very little oil on the cotton swab. You will be pretty surprised by the effect. Hydrogen can help you in the same way. You must have had a problem with removing a waterproof mascara. Women know best that a high-quality mascara always needs a high quality make up removal. If you happen to have no adequate means to remove waterproof mascara, please use baby oil. Apply it on a swab and lightly remove the mascara. In return, you will also have a protective layer on them, which will give them a shine. You can also remove the rest of the makeup in the same way, but after that, wash the face and remove the rest of the oil from the face so that it does not clog up the pores on your face. If you use wax for depilation is known that the skin in certain places remains sticky. To remove this surplus, feel free to soak a tissue paper with baby oil and solve the problem. During pregnancy, the skin is forced to grow at high speed, which leads to cracking. Bodybuilders also face the same problem. By using baby oil, you will increase the elasticity of the skin and reduce the appearance of stretch marks to a minimum. All the ladies struggle with this problem. For this phenomenon, in addition to genetics, atmospheric conditions are also responsible. Especially when we are on vacation, we expose the hair to the sun more than usual. To protect hair lines, it is enough that you apply very little oil to the tips of still moist hair. This will create a protective layer that will protect the ends of your hair from damage. Removing the Band-Aid from the skin can be very unpleasant, especially in small children. In order to make the entire procedure completely painless, it is enough to soak the ends of the Band-Aid with baby oil and when they are soaked, simply remove it. How long have you been trying to remove the stickers from the jar or bottle? Probably a long time. You used everything most commonly the dishwasher. This is the end of it. Now, take the baby's oil, lubricate that resistant sticker, wait for the stick to absorb the oil and just take it off. Easy, is not it? It happens that all of us had marker stains on the skin as children who often use them to show their creativity. Now that we have baby oil we can will solve this problem easily. Soak a cloth with baby oil and remove all marker stains from your skin. All leather bags, shoes or some other leather items will get a new glow if you treat them with baby oil and then a dry cloth. The baby's oil will nourish the leather and make it more durable and better. Your doors or windows make a squeaking sound? You can guess that baby oil can help you with this problem. Lubricate the hinges with a few drops of oil, and open and close door couple of times in order for the oil to lubricate the mechanism completely nicely and then the persistent sound will disappear.